This past week, floods have had a devastating impact for millions of people in southeastern Asia, particularly Pakistan, Nepal, India, and Bangladesh. Over 800 people have been killed this past week in Pakistan alone. 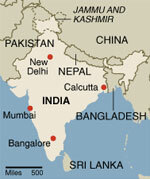 The death toll in India is now at 1,225 people since the beginning of a monsoon two months ago in June. The worst affected states in India include Assam, Bihar and Uttar Pradesh where more than 12 million people have been affected by flooding over the last week. Jenny (Sinead) Browne rsm (pictured at right) is a Sister of Mercy belonging to the Congregation (Ireland) Southern province. 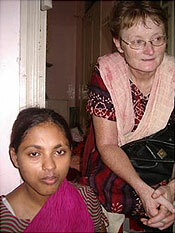 Since 2001 Jenny has ministered in India as the Irish co-ordinator of HOPE Foundation. 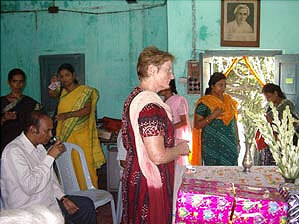 This organization works with street and slum children and their families in Calcutta, India. In a city of over 13 million people, Calcutta is home to 250,000 street children between the ages of 3 and 12; approximately 100,000 of these children have no form of shelter. The goal of Hope Foundation is to provide the support and skills for these children and their families to build a better future for their families, free of poverty. HOPE is holistic in its approach as it has projects in education, vocational training, health care, drug rehabilitation, child protection, and other areas. Approximately one-third of the world’s illiterate population lives in India; there is overwhelming poverty and malnutrition; street children and their families are particularly vulnerable to sicknesses related to poor water and lack of sanitation facilities. With the immensity of the issues involved, HOPE partners with other Indian charity organizations and people of goodwill worldwide to impact change in the lives of those with whom they minister. Hope Foundation is a charity foundation with incorporated offices in Germany, India, Ireland, and Scotland. Through the support of generous donors in these countries and beyond, it funds 60 projects, including Crèches, Child Protection Homes, Clinics, Hospitals, Coaching Centres, Vocational Training Centres & ChildWatch programmes. Hope is providing education to 20,000 children and primary health care to over 80,000 people. Jenny (Sinead) Browne rsm at a ceremony of presentation of certificates to women in skill training.